Pipette Stand 94 Pipette Rotary is moulded in Polypropylene, this unique Stand holds a maximum of 94 pipettes and rotates on a central vertical axis for convenient selection of any particular pipette. The lower rotating disc has four concentric troughs with tapered sides and open bottoms which cradle the pipette tips protectively and permit water drops to run off. The upper disc has a grid pattern concentric with the bottom disc and keeps the pipettes vertical. Liquids draining off the pipettes are retained on the top of the stationary base by the outer ring. This stand can be easily disassembled & reassembled. 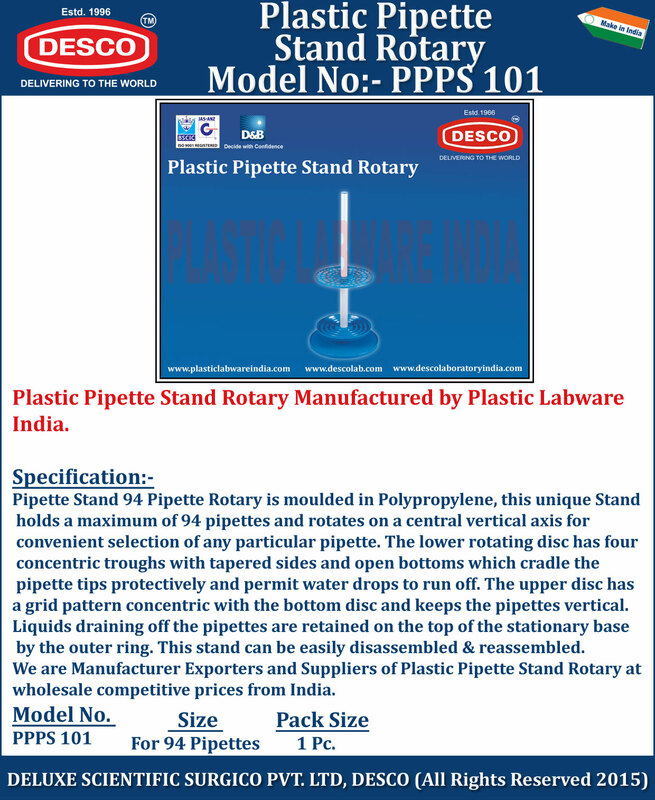 We are Manufacturer Exporters and Suppliers of Plastic Pipette Stand Rotary at wholesale competitive prices from India. PPPS 101 For 94 Pipettes 1 Pc.